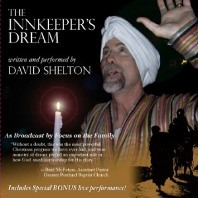 The Innkeeper's Dream 32nd Anniversary! "I've always prayed I'd have the opportunity to meet David Shelton and thank him for blessing my family with The Innkeeper's Dream." "Thank you for this wonderful performance. We keep ours with our Christmas decorations and it's become part of our annual tradition." Available on both DVD and CD of the original broadcast on Focus on the Family.